The processes prove that Armenia is more interested in approving the protocols signed in the Swiss city of Zurich and the opening of borders with Turkey, New Azerbaijan Party deputy executive secretary said. 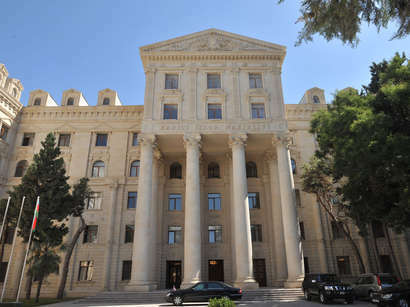 "Armenian Constitutional Court's positive evaluation of the protocols signed with Turkey testifies it," New Azerbaijan Party deputy executive secretary, MP Mubariz Gurbanli said on the website of the party. Turkish and Armenian foreign ministers Ahmet Davutoglu and Edward Nalbandian signed the Ankara-Yerevan protocols in Zurich Oct. 10. Diplomatic relations between Armenia and Turkey were broken due to Armenian claims of an alleged genocide and its occupation of Azerbaijani lands. Their border closed in 1993. According to Gurbanli, earlier Armenia said that it will submit these protocols for discussion after their approval in the Turkish Parliament. "But the course of events shows that occupier has receded from their claims. All this shows that the most interested party in the opening of the borders is Armenia. There are views that there are forces opposing the protocols in this country among the Armenian lobby. It is a clear example of the Armenian guile and hypocritical policy on this issue ", deputy executive secretary said. He said a few days ago the Turkish Parliament said that the border will not open unless there is progress on Nagorno-Karabakh issue. "The opening of borders would give a breath to Armenia, which is in a difficult economic situation. But Turkey's position in this matter is clear," New Azerbaijan Party deputy executive secretary said. Recalling the recent telephone conversations between foreign ministers of Turkey and Armenia, Gurbanli thinks that the Armenian side has implored Turkey. "Turkey retains its conditions concerning the border opening. In general, there are serious processes in the region. These processes also prove strengthening of Azerbaijan's position ", he said. New Azerbaijan Party was founded in 1992 by Azerbaijani National Leader Heydar Aliyev. That time he was a chairman of Nakhchivan Supreme Majlis. Now Azerbaijani President Ilham Aliyev heads the organization.